It had been three years since WWE's Royal Rumble event emanated from the Wells Fargo Center in Philly, and the ending to that one with Roman Reigns standing tall with The Rock trying to get the crowd behind him did not exactly go over as well as WWE had hoped. The recent run of Rumble pay-per-views had left a lot to be desired in terms of the winners and how the crowd would react to them. It's been a while since the crowd really got behind the Rumble winner the way we'd been accustomed to through the years. But Sunday night was completely different, in a good way. The Philly crowd would be treated to the first-ever women's Royal Rumble match, a shocking debut, and a few underwhelming title matches. However, the underwhelming title matches weren't enough to overshadow the absolute brilliance in not just one, but both Rumble matches. In the four-hour main card, the men's Rumble match began just ahead of the second hour, which was a surprise to many. But there was a reason for that. Stay tuned. Really good, long Cruiserweight match. In the end, it doesn't mean anything, unfortunately. But good first match to get the crowd ready for the night. Dash Wilder and Scott Dawson got their revenge from RAW 25! Good match. This was Roode's first title defense on pay-per-view after winning it a couple weeks ago in a tournament after Dolph Ziggler just left it laying in the ring after he'd won it. It was an OK match but certainly didn't steal the Kickoff Preshow. This storyline leading up to this was a little wonky, but I don't think heading into WrestleMania we were going to have a co-champion storyline with Owens and Zayn. That proved to be the case after Styles pinned Owens when he was going for a Pop-Up Powerbomb by rolling him up. After the match, the replay showed that Zayn likely never tugged Owens' hand to make him the legal man in the match when Styles pinned him. So I don't think this angle is that far from over, but for now, Styles is still the champion and should still be the champion heading into WrestleMania. And he's ready. This match started off fast, cooled down a little bit, but was still a very good match. Everything the Usos touch lately has been gold, and Gable and Benjamin have vastly improved as a team. The match went on pretty long with close falls, but no official decisions. Then, all of a sudden, two came rather quickly. Both Usos superkicked Gable separately, then together and Jey Uso pinned him for the champions to take the first fall. So, naturally, Gable and Benjamin would likely take the second fall, right? Nah, that's not how this one would work. A few moments later, Gable and Benjamin got the upper hand in the match and were ready to set up Jey for their finisher, but the Uso got Benjamin in a small package before Gable could interrupt the count and pinned him. The Usos had retained the tag titles, 2-0. Much to the surprise of many, the men's Royal Rumble match was next. There were some great moments in this year’s Rumble. One of my favorites was Kofi Kingston doing yet another innovative save from elimination. He, of course, had help from his teammates this time. Jinder Mahal had eliminated both Big E and Xavier Woods before thinking he eliminated Kingston. However, one of Kingston’s feet hit the floor, and the other landed on Woods. Both Woods and Big E would help launch Kingston back into the ring over Mahal’s head, who was trying to prevent it from happening. Great spot. The Hurricane made a surprise appearance! The superhero thought he was going to eliminate John Cena. Didn’t happen. Cena then easily eliminated him. The final six had a fun moment where it was old school vs. new school, so to speak. We had Cena, Orton and Mysterio on one side, and Bálor, Reigns and Nakamura on the other. Bálor put on one hell of a show, but was eliminated by Cena after spending almost an entire hour in the match. It came down to Nakamura, Cena and Reigns, and there was one clear guy among the three that would elicit a fan reaction the likes of we haven’t seen in years. And it happened. Nakamura eliminated Cena after hitting him with the Kinshasa on the ring apron, then after a back-and-forth bit with Reigns, hit him with the Kinshasa then threw him over the top rope to one of the loudest fan reactions I’ve ever been a part of live. After the match, Nakamura picked the champion he wants to face at WrestleMania – AJ Styles. After the highly-entertaining men’s Rumble, I thought at least the remaining tag team title match would deliver. The crowd was completely dead for it, but it’s not like they really had anything to get emotionally invested in, either. With Rollins and Jordan forming this team and Jordan’s subsequent heel turn subtleties, their interactions and matches on Raw had at the very least been entertaining. But there’s not much they could do to make this match worthwhile. With Rollins going for a tag to Jordan, Cesaro yanked Jordan off the ring apron and shoved him into the steel LED ring post. Jordan stayed on the ground for a while with seemingly a head injury, likely a concussion. Interesting angle to take there. Jordan never really got back in the match, stayed on the floor and then sat on the ring steps as The Bar took it to Rollins. Jordan would tag in eventually but just couldn’t defend himself, so he tagged back out quickly. Cesaro and Sheamus finished off Rollins to win the Raw Tag Team Championships again. While concussion angles are always controversial to take, especially in today’s society, a pro wrestling heel thing to do would be to fake the injury and eventually turn on your partner. Why? Well, that’s for WWE’s creative team to figure out a good reason why Jordan would do it. Other than that, I’m not sure where they can go from here. Let’s hope it’s not the Jordan is weak because he had a legit concussion storyline. That just won’t go over well at all. Man, oh man. This was the same stuff we’ve seen from Lesnar. He wasn’t really given much to work with, though. We know his one-on-one match with Braun Strowman wasn’t that great, and for some reason, Kane is back. There were table spots galore here, but that didn’t do much to make the match entertaining. Lesnar pinned Kane after an F5 onto a steel chair. Then came the main event of the evening. And it was a good one. Lita returned as the fifth entrant into the fray, and certainly made her presence felt. There was a scary moment later in the match where she went for a moonsault off the top rope and was too low to the ground when beginning her flip. She’s lucky she didn’t injure her neck very badly upon landing, but that didn’t stop the Philly crowd from chanting, “You still got it!” I kind of looked around the arena confused because I wondered if the rest of the masses saw something different than I just did. There’s a reason why Lita’s retired. It was a fun surprise, but I’m glad she didn’t seriously injure herself just to make some history. Kairi Sane’s involvement was great, and seeing her work in the elbow drop in the match was an awesome sight. After the match, both women’s champions entered the ring. 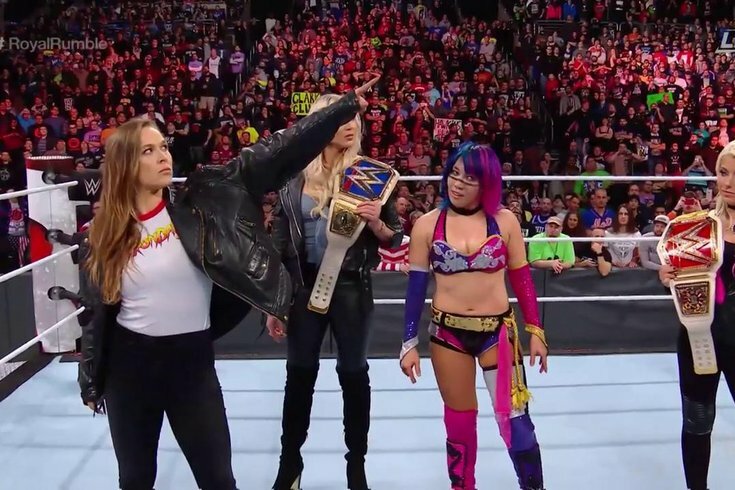 But before Asuka could make her decision on which title she wanted to go after at WrestleMania, Ronda Rousey made her official WWE wrestler debut! Paying homage to one of her idols, “Rowdy” Roddy Piper, Rousey’s video and shirt was in the old school Piper design. Rousey entered the ring and pointed at the WrestleMania sign. Will she be in a title match then? Will she get whoever Asuka doesn’t choose? Lots of questions remain. And a lot of people were upset because they thought it took away this moment from Asuka. And, at least from what only I can offer, I thought this made this moment bigger. Rousey’s a WWE employee now. It’s not some UFC fighter coming in to steal the spotlight. And it was a great way to debut her. Asuka swatting Rousey’s hand away when she went for a handshake may have even done Asuka some good! The fever pitch for women’s wrestling in WWE has never been higher, and I think this just puts the spotlight more on it. It’s up to WWE to make the most of it.